There is no single compelling factor to justify the bombings as inevitable, argues Peter Hayes. Rather, a series of decisions and events cumulatively drove the bomb forward from development to deployment at Hiroshima. The later nuclear attack on Nagasaki, moreover, was gratuitous. This report was initially published in the Fall 2015 issue of Global Asia. Peter Hayes is Professor at the Centre for International Security Studies, Sydney University, Director of the Nautilus Institute and a Global Asia editorial board member. The atomic bombings of Hiroshima and Nagasaki remain within living memory. The mayors of these two cities, the first to be annihilated by nuclear weapons, have invited the Group of 7 leaders to meet with Japanese hibakusha (bomb survivors) after their May 2016 summit in Ise-Shima. If they go — as they should — the question of whether the bombings were necessary should be uppermost in their mind. “Yes” would mean that nuclear deterrence, and its spawn, nuclear extended deterrence, have historical underpinnings justified in universal morality and international law, starting with Hiroshima and Nagasaki. “No” would commit them to abolishing nuclear weapons, however long it takes, as the necessary redemption for needlessly sacrificing these two cities. Today, this choice is starkly binary, albeit complex. In 1945, the decision to use the bomb was not obvious or even well understood by many of the key players. The simplest of the competing narratives that dominate reflections on the bombings is that these attacks were inhumane in a new and unimaginable way, and simply should never have taken place.1 This is the perspective of the Japanese survivors (although not of the Korean survivors who were working in Hiroshima and Nagasaki at the time, many of whom wished the United States had dropped more nuclear bombs on Japan). That the bombings were a new type of war crime was the view of the Japanese government, which protested to the US State Department to this effect via the Swiss Legation on Aug. 11, 1945. The third interpretation of the attacks is the apocalyptic account that seized the imaginations and political agendas of many political and intellectual leaders during the Cold War, but was prefigured even before the first nuclear bombings. The Hiroshima and Nagasaki bombings destroyed nature, stopped time and obliterated all meaning for these cities until they were rebuilt and repopulated. The threatened repeat of the same story was writ large during the Cold War for the entire planet. The absurdist mega-tonnage accumulated by the superpowers threatened to not only destroy hundreds of cities, but to end life as we know it, or even lead to human extinction. Meanwhile, the entire human population today lives with the knowledge that nuclear war is possible at any moment. The impossible demand that nuclear weapons must never be used but must always work in order to deter their use suggests that eventually next-use and escalation to all-out nuclear war will occur — especially as nuclear weapons spread. In a sense, humans are the walking dead, following leaders who are pathologically immune to the preparations they have made to destroy our existence. This global risk is the basis of nuclear deterrence, the direct descendent of the original bombings. The logic of nuclear deterrence is that we must make ourselves vulnerable to nuclear destruction at the hands of a nuclear-armed adversary in order to convince them that they in turn will be destroyed by our retaliation — if only because the vaporization of our leadership implies loss of control of our own nuclear forces, in turn meaning that no adversary can be assured that retaliation will not result in response to its first-strike aimed at limiting damage from us in the first place, thus ensuring that they will never attack us with nuclear weapons. Got that? In this context, “we,” “us” and “adversary” can be any one of the nuclear-armed states, or a nuclear-armed non-state actor able to take states or cities hostage, or to attack them with nuclear weapons — now an additional, contrapuntal theme in the symphony of state-based preparation for wars of nuclear annihilation. Each narrative provides only a partial account of the bombings. Depending on who you were and where you stood at 8:16am on August 6 and 11:02am on August 8, the bombings could be viewed as tragic, heroic or a precursor of apocalypses to come. Even the most prescient of the scientists, military officials and political leaders had only a limited understanding of the full destructive power of nuclear weapons and their impact on the conduct of states and the resulting structure of international affairs. In reality, the bombing was the result of many decisions, culminating in the choice of targets, and the go-order given to the military on July 25, 1945, to deliver the first bomb as soon as weather permitted visual bombing after about Aug. 3. Thus, to answer the question “was it inevitable,” one must specify what the bombings aimed to achieve, and then address each of the possible drivers of the decision. If one or more of these drivers turns out to have been contingent, then other choices could have been made, the nuclear bombings might not have occurred and the Cold War balance of nuclear terror might not have emerged, at least not in its fantastic incarnation of mutual assured destruction. The simplest choice revolved around whether using nuclear weapons against Japanese cities was necessary to win the war. The short answer is no. US air and naval power had already driven Japanese forces from most of their forward-deployed positions, the United States was assured by July 1945 that it would win the war against Japan. Was the choice made to minimize US military losses in an assault on the Japanese mainland, given the Japanese rejection on July 29, 1945, of the allied demand at Potsdam for unconditional surrender? This is debatable. The standard argument, based on the battles to take Iwo Jima and Okinawa, is that it saved millions of lives — not just military lives that would have been lost in the course of invading Japan, but also more Japanese civilian lives than had been combusted already in the fire bombings of sixty-four Japanese cities by early August 1945. The obvious riposte is that many of these invasion-related casualties could have been avoided by simply starving out rather than invading Japan. By that August, the rapid execution of whole cities was already part of the arsenal of modern total war — German, American and Japanese. In a military sense, the nuclear bomb was simply more of the same, adding little to the incendiary bombs already in use except for the contribution of shock waves and radiation and the compression of the horrible act into seconds from hours and days. Japanese leaders had already proven immune to the effects of firebombing, and it is not clear at all that the nuclear bombings actually led to the Japanese leadership’s capitulation on August 11. Moreover, the historical record shows that other factors than minimizing casualties played an important part in the American calculus. Thus, the US military did not bomb candidate target cities in order to ensure an accurate assessment of nuclear bombing unaffected by conventional bombs. The detonations were calibrated to maximize effects (especially detonation altitude to test shock wave effects given local topography), and the desire to ascertain the relative physical effectiveness of the uranium (Hiroshima) versus plutonium (Nagasaki) bombs on different targets. There was also the powerful, perhaps ineluctable political-bureaucratic momentum of the US military command and the leadership of the Manhattan Project, for whom the bombings were the culmination of years of investment in scientific and technological research and development with the assumption that the bombs would be dropped as soon as they became usable, as new weapons of war, nothing more. The character of the American commander-in-chief, President Harry Truman, was also an important factor. Inaugurated in April 1945, Truman knew little about the bomb except that it was big, it worked and it could be used to shock the Japanese and display American power to the Soviets. Some have argued that the attacks were racist, but Truman’s diaries indicate he was focused on the military goal of ending the war as quickly as possible, not on racist antipathy. As he wrote on July 25, 1945, while the Japanese are “savages, ruthless, merciless and fanatic, we as the leader of the world for the common welfare cannot drop that terrible bomb on the old capital or the new.” Rather, “the target will be a purely military one,” a presidential preference that had no impact on actual military planning.5 Indeed, decision memoranda from the US military specifically note that candidate target cities were chosen not only because they contained military bases or industrial facilities, as did Hiroshima and Nagasaki, but also because they contained political leaders and industrialists seeking refuge from the incineration of Japan’s cities.6 There was no such thing as Truman’s “purely military” target city. Truman also rejected a demonstration bombing because it might have failed after issuing an ultimatum. There is no evidence that the senior American leadership were seeking nuclear revenge for the perfidious “sneak” attack on Pearl Harbor. Nor was the nuclear bombing intended to punish Japan for its own atrocities and depredations across Asia and the Pacific. Some revisionists, most notably Gar Alperowitz, argue that the bombings were the first shot in the US-Soviet post-war competition, already a key factor in US war-planning since 1943.8 Thus, the bombings were intended to force Japan to capitulate immediately, before the Soviets could invade northern Japan and demand the right, along with US allies, to dictate the terms of Japanese surrender. And indeed, as noted above, there is evidence that the Soviet entry into the war on August 9, not the nuclear bombings, drove the Japanese decision to surrender two days later. But the latter was not known to Truman when he ordered the bombings, although he had plenty of advice arguing that this would be the effect of the Soviet entry. There is also no way he could have been certain about the outcome of the murderous intrigues inside the Japanese leadership at that time between military ultra-hardliners and those arguing for immediate surrender. None of these factors justifies the bombing as inevitable. Rather, the decisions made in each domain cumulatively drove the bomb forward from Alamogordo onto Hiroshima. The nuclear attack on Nagasaki, intended to reinforce the psychological impact of Hiroshima and to portend the wave of additional nuclear strikes referred to in the Aug. 6 press release (in fact, a bluff, because only two nuclear bombs existed), was gratuitous. 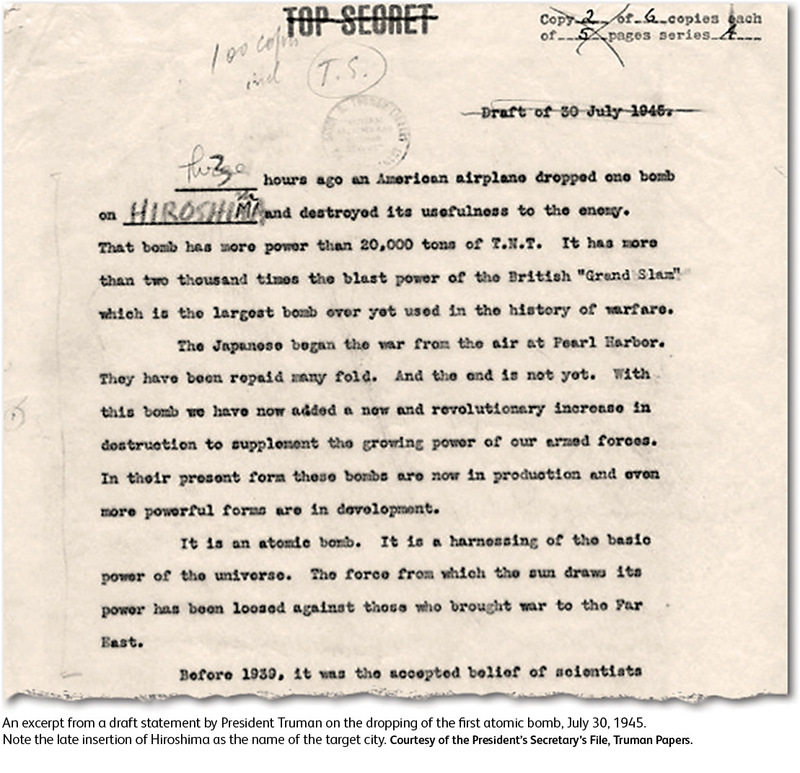 Arguably Nagasaki had little or no further impact on the already minimal impact of the Hiroshima bombing on Japan’s willingness to surrender; the second bomb could have been held in reserve for later demonstration use without executing a second city. Truman could have waited a few days to see if the pending Soviet entry into the war led to immediate surrender in Tokyo. By the end of the war, the world was awash with blood. Leaders were inured to making strategic decisions that killed millions of people. Millions of individual soldiers became skilled at killing their enemy in an intimate, first-hand manner. The ferocity left laws of war lagging far behind the rapidly evolving practice of killing on an industrial, massive scale never before seen. The drive to end the war on American terms, to underscore American power to all parties, not just Japan, and to demonstrate and control this new source of political and military power, absolute in ways never before available, drove the decision to push violence to a new extreme. Thus, if the power was available, the United States had to have it, and to have it, had to demonstrate it, starting with Japan. Given the nature of total war in American military thinking reaching back to Sherman’s march to the sea during the Civil War, the widespread strategic bombing of cities in Second World War, the momentum of the Manhattan Project, the obdurate nature of Japan’s leaders and the desire to dictate the terms of post-war surrender in the Asia-Pacific region, it would have taken a far greater statesman than Truman to not proceed. Given the context, only the institution of the presidency could have resisted this pressure. Perhaps if President Franklin Roosevelt had lived longer, Hiroshima and Nagasaki might have been fire-bombed instead. Had that occurred, we might also have avoided the balance of nuclear terror during the Cold War, found ways to ban nuclear weapons from the outset and live today in a very different world that does not rely on nuclear weapons to avoid nuclear war. 5 Truman quoted in Robert H. Ferrell, Off the Record: The Private Papers of Harry S. Truman (New York: Harper and Row, 1980) pp. 55-56.